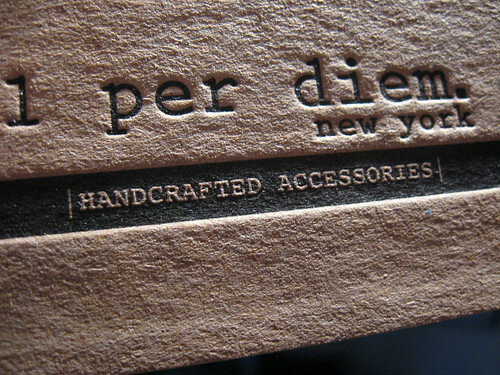 We wrote yesterday about some great paper from The French Paper Co. (Business Cards on French’s Muscletone), and today we wanted to share these kraft board business cards we recently printed for 1 per diem, a brand that is all about handcrafted accessories. Vanessa, principal of 1 per diem and FIT graduate, strives for perfection. Everything is made in a family-owned factory in NY, which not only helps support small businesses (something we love to do) but also allows them to oversee the production of every piece. 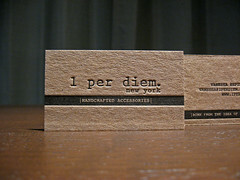 Letterpress cards were the perfect choice for Vanessa and the brand. The unique look, thick-rich stock, hand-crafted production, and a return to basics is exactly what letterpress is all about. The front/back of the cards contained both type and solid stripes with knockouts. There is a thin line that we toe with every project between achieving a nice impression and minimizing bruising/push-through. The backs were printed first, and then the fronts to yield a heavier impression for their logo. The knockouts on both sides are something we’ve shown before … we love the way they look, a really neat effect! If you run your fingers over the stripe you can feel the letters raised off the black (photo above). 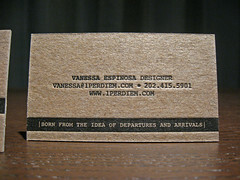 Vanessa designed the cards in conjunction with Chris Richter. 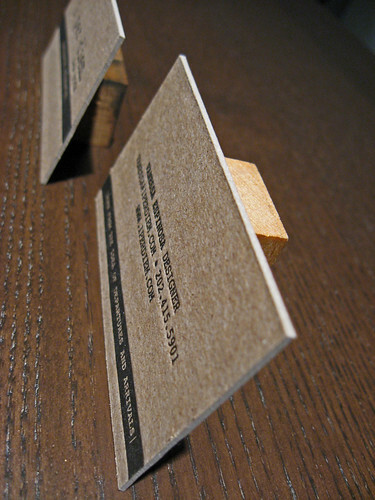 The business cards were letterpress printed on both sides in black ink using a special kraft board – super thick! So you’ve made it to the end of the article … your reward? Take a gander at some of Vanessa’s creations at her shop. If you’re in NY/DC you can see some of her crafts in person at these fine retailers. OR … tell us what you think below!